The future of our cities is not what it used to be. The modern-city model that took hold globally in the twentieth century has outlived its usefulness. It cannot solve the problems it helped to create—especially global warming. Fortunately, a new model for urban development is emerging in cities to aggressively tackle the realities of climate change. It transforms the way cities design and use physical space, generate economic wealth, consume and dispose of resources, exploit and sustain the natural ecosystems, and prepare for the future. In Life After Carbon, urban sustainability consultants Pete Plastrik and John Cleveland assemble this global pattern of urban reinvention from the stories of 25 "innovation lab" cities across the globe—from Copenhagen to Melbourne. A city innovation lab is the entire city—the complex, messy, real urban world where innovations must work. It is a city in which government, business, and community leaders take to heart the challenge of climate change and converge on the radical changes that are necessary. They free downtowns from cars, turn buildings into renewable-energy power plants, re-nature entire neighborhoods, incubate growing numbers of clean-energy and smart-tech companies, convert waste to energy, and much more. Plastrik and Cleveland show that four transformational ideas are driving urban climate innovation around the world, in practice, not just in theory: carbon-free advantage, efficient abundance, nature's benefits, and adaptive futures. And these ideas are thriving in markets, professions, consumer trends, community movements, and "higher" levels of government that enable cities. "Life After Carbon is a highly engaging, forward-looking study of how modern cities are innovating to survive...This superb book looks at the evolution of the world's cities and their challenging future...Life After Carbon is essential reading for anyone with a stake in the development of tomorrow's cities." 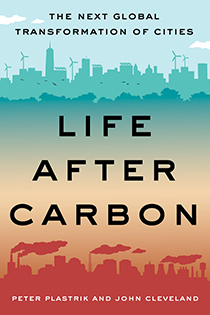 "Life After Carbon is a vivid and multifaceted look at the cities leading the global transition to a post-carbon world. Drawing insight from and connections among the communities at the forefront of urban climate innovation, Plastrik and Cleveland chart much-needed and promising pathways into the future." "In Life After Carbon, Plastrik and Cleveland lay out a hidden upside of climate action, detailing how innovative cities leading the fight against climate change are developing a new model for urban development that promises better cities in a carbon-free economy. This is an important and inspiring book for business leaders and other professionals in their efforts to create more livable cities while strengthening climate resilience." "Plastrik and Cleveland give readers nothing less than a new and compelling vision for what cities could be: carbon-free, climate adaptive, biophilic and nature-rich, with restorative closed-loop metabolisms, and, of course, wonderful places in which to live. Together these stories, ideas, and emerging practices chart an optimistic urban future. Life After Carbon is an essential resource for planners, mayors, and citizens (all of us) with a vested interest in accelerating this future." "Plastrik and Cleveland have written a timely, affirmative account of urban innovation and transformation in the face of climate change. Their vision of the post-carbon city is captivating and compelling, with ideas that are tangible, transferable, and scalable. This is a much-needed contribution at a pivotal moment." Bruce Katz, coauthor, "The New Localism: How Cities Can Thrive in the Age of Populism"
With climate change already impacting us, what policies should we prioritize now to achieve a low carbon future? And what are the models for urban development that will put cities on the low carbon path while helping them thrive in a changing climate? Join SSF and Island Press in a 90-minute webinar to explore these questions. Peter Fox-Penner, Director of the Institute for Sustainable Energy at Boston University, will moderate. 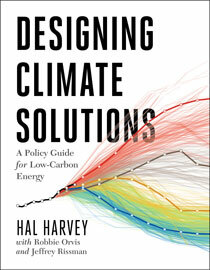 He’ll be joined by panelists Hal Harvey, CEO of Energy Innovation and co-author of Designing Climate Solutions, and John Cleveland, Executive Director of the Boston Green Ribbon Commission and co-author of Life After Carbon. In the latest episode in our series of Urban Resilience Project (URP) podcasts in partnership with Infinite Earth Radio, host Mike Hancox speaks with Peter Plastrik about Life After Carbon, his new book on the next global transformation of cities in the era of climate change.